Every stargazer needs a pair of binoculars. Unlike most telescopes, binoculars are easy and intuitive to use. They produce a right-side-up image and a large field of view, which makes it easy to aim them at an object and find what you’re looking for. And they don’t need any time to set-up and align. You just grab them and head outside under the stars. Binoculars are especially useful for seeing large craters on the Moon, the moons of Jupiter, the occasional comet, close groupings of the Moon and planets at sunrise and sunset, and, once you know how to find them, larger star clusters and groupings of stars all over the sky. In this article, you learn how to choose and use a reasonably-priced pair of binoculars for astronomy. “Never mind binoculars”, say many impatient beginners. “I want a telescope!” But of course, binoculars are telescopes! They are simply two small telescopes side by side. There’s an objective lens at the front of each tube and an eyepiece at the other end, and glass prisms in between to move the light around to make the eyepieces close enough to look through comfortably. Most astronomical binoculars use a pair of Porro prisms in each barrel to direct the light from the objective to the eyepiece (see image below). By convention, all binoculars are marked with two key numbers: their magnification and aperture. A pair marked 7×50, for example, magnifies 7 times (or 7x) and has objective lenses 50 mm in diameter. The bigger the lenses, the fainter the objects and the more detail you will see. A 50 mm lens will collect 50-60 times as much light as your dark-adapted eye, which means you will see objects 50-60 times fainter. While binoculars generally have smaller objective lenses and lower magnification than telescopes, they are also much lighter and often less expensive. Binoculars that magnify between 6 and 10 times are extremely useful for stargazing and are usually light enough to hand hold for short periods of time. Higher power means you’ll see more detail and a darker background sky. But you’ll also see a narrower field of view, and it’s harder to keep a high-power pair of binoculars steady enough to see fine detail since the slight shaking of your arms is also magnified. For hand-held use, magnification of 7-8x is optimum, and 10x is maximum. Because of their larger aperture, a pair of 10×80 binoculars lets you see fainter objects than a 10×50 pair. The trade-off? Bigger lenses mean more weight, and lenses larger than 50 mm are heavy which makes it harder to hold such binoculars steady for any length of time. Binoculars also allow viewing with both eyes. This is more comfortable and natural, and it helps many observers get a perception of depth, though this is an illusion with objects of such large distance. You also avoid the distracting effect of blind spots and floaters in one eye or other. Dim objects actually appear brighter when viewed with both eyes. Another key measure of binoculars is the “exit pupil”, the size of the bright disks of light you see in the eyepieces when you hold the binoculars at arm’s length. 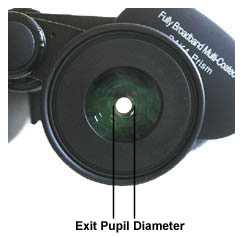 The exit pupil is simply the ratio of aperture to magnification. So a 7×50 pair has an exit pupil of 50/7 = 7 mm (roughly), and a 7×35 pair has a 35/7=5 mm exit pupil. The exit pupil of binoculars. Ideally, this matches but does not exceed the exit pupil of the observer’s eye when dark adapted. You want to try to make sure the exit pupil of your binoculars is no larger than the size of your eyes’ pupils when they are adapted to the dark. Under age 30, most people have a dark-adapted exit pupil of 7 mm. But we lose about 1 mm every 10-15 years. At age 50, for example, it may not make sense to use binoculars with an exit pupil larger than 5-6 mm. So if you’re older, a pair of 7×35’s or 8×42’s (both with a roughly 5 mm exit pupil) might be a better choice than a pair of 7×50’s (with a 7 mm exit pupil). Such binoculars are, on average, less expensive as well. When you select binoculars, stick with Porro-prism binoculars, the classic type of binocular where the objective lens and eyepiece are offset. Binoculars that have a “straight through” view use roof prisms, and a good pair is expensive. You don’t need to pay the premium. Avoid binoculars with a zoom feature or a built-in camera. They don’t make the grade for astronomical use. If you can, shop for binoculars in person. When you’re at the store, pick up the binoculars and look at light reflected in the objective lenses. If the lenses have a good anti-reflection coating, they’ll appear mostly dark, with a bit of reflected color. If the lenses appear white, or ruby red, don’t buy them. Good anti-reflection coatings on an objective lens should appear clear and nearly colorless, as if you can barely see them at all. Look through the lens at the prisms inside. A good anti-reflection coating shows a colored prism surface. A white surface means no AR coating. Not good. Now hold the pair away from your face with the eyepieces toward you. Look at the bright disk of the exit pupil. The disk appears round if the prisms use high-grade glass (called BAK-4 glass, if you’re interested). If the disk appears squared-off, the prisms are made from lower-grade BK-7 glass. Not terrible, but not optimum. If you’re near or far sighted, you don’t need to wear your glasses when looking through binoculars. But if you have astigmatism, you may need your glasses. Make sure you can see right to the edge of the field of view while wearing your glasses. And if you do wear glasses when observing, make sure the binoculars have sufficient eye relief to allow you to see the full field of view with your glasses on. You need a minimum of 15 mm of eye relief, typically, to do the job. Most astronomy binoculars have at least this much eye relief, but it doesn’t hurt to check before you buy. Finally, look through the binoculars, and bring an object into focus at the centre of the field of view. A decent pair of optics will also hold focus out to the edge of the field. It may not be perfectly focused. But if the edge of the field is way out of focus or highly distorted, move on to another pair. Large and bright star clusters like the Pleiades often look better in binoculars than in telescopes. What separates a $200 pair of binoculars from a $2,000 pair with the same magnification and aperture? The complexity of the AR coatings, the quality of lenses and prisms, and the precision of the lens shape. An expensive pair gives crisp, high-contrast views without distortion right out to the edge of the field. Nice to have, especially for daylight use, but not critical for casual astronomical use. As far as brands, there are many good ones. Orion, Bushnell, Nikon, Celestron, and so on, all make quite good optics. Just follow the steps and suggestions in this article and the last one. Some may disagree, but if you pay less than $75-100 for a new pair of binoculars, you’ll be disappointed with what you get. On the other hand, almost no one needs to pay more than $300-$400 for an excellent pair. Between $100-300, you’ll be spoiled for choice. As a rule of thumb, get stargazing binoculars with an aperture of 35 mm to 60 mm aperture and a magnification of 7x to 10x. A pair of 7×35’s is about the minimum acceptable for astronomical observing; 7×50’s are better… this will give you the same magnification but a wider field of view. These 9×63 binoculars by Celestron give bright images but they are about as heavy as most people can use without a tripod. And yet… if you are older than 40, you may not need the 7 mm exit pupil provided by 7×50’s, so you might consider 8×42’s which give slightly larger images. If you don’t mind a little more weight, a pair of 8×56’s or 10×50’s are superb choices for stargazing. Also, 9×63’s are excellent, though they are getting a little on the heavy side. Any more than 10x, and the image will get a little shaky. Any bigger than 63 mm, and the binoculars will get too heavy to hold for long periods. You want to stick with a pair that weighs less than 2.5 lbs (1.1 kg). What are the very best binoculars for stargazing? The answer is, quite simply, a pair of image-stabilized (IS) binoculars. IS binoculars give stunning low power views of the night sky without the dreaded “image shake” of standard binoculars. It’s hard to read a review that doesn’t rave about these advanced optical systems for astronomy or terrestrial use. Based on technology developed for military surveillance and laser-based weaponry, IS binos are amazing high-tech wonders. Inside the body of the binoculars, piezoelectric motion sensors detect the pitch and yaw motion caused by the natural shake and jitter of your hands and arms. The sensors feed into a microprocessor that initiates image stabilization by controlling a vari-angle prism – a pair of glass plates joined by flexible bellows. The space between the plates is filled with a silicone-based oil to maximize image deflection to correct for the unwanted motion. The motion sensors work in daylight or total darkness and operate at any orientation, so there are no restrictions on where the binoculars can be pointed… up, down, sideways, anywhere. You switch on the IS feature by pressing a button. When you do, the image doesn’t “freeze”, but rather wanders slowly enough for your eye to follow. If your arms shift a little, you’ll still see the image move, but it’s much slower and steadier than without the IS feature. The IS still works when you sweep across a field of view, although there is a slight hesitation. It takes a few seconds for the IS to kick in, and perhaps 10-15 seconds for the IS to really get a hold of the motion of your slightly shaking arms. One drawback: these devices are battery hogs. You can burn through a pair of alkalines in 5 minutes on a cold night. With rechargeables, you might get 2 hours, or longer with warmer temperatures. Of course, you can turn off the IS feature when you’re not using it. Nikon, Canon, and Fujinon, among others, offer some type of image stabilization. Canon models seem to have the widest following among amateur astronomers. IS binoculars are priced at a serious premium. In North America, a pair of Canon 10×30’s go for about $500. A pair of Canon 12×36 IS costs about $750. The Canon 10×42’s (which are waterproof and have special ED lenses) go for $1,400. The more expensive binoculars give you a brighter view of the stars, but they are heavier… about 2-3 lbs, which is hard to hold for a extended period. Are IS binoculars worth the extra cost? In a 2006 review of Canon’s 10×42 IS binoculars, Gary Seronik said “These are simply the finest binoculars I have ever used for astronomy”. Most experienced stargazers agree. If you can afford a pair IS binoculars, and if you enjoy quick, convenient, wide-angle views of the night sky, I recommend you pick up a pair. They’re not a “must-have”, but they’re an “awfully-nice-to-have”. The Moon is a spectacular sight in nearly any pair of binoculars.